ario Lanza may not have distinguished himself as a screen actor, but he could never be accused of woodenness. Although he had a tendency to overact, he generally acquitted himself well in his films—no mean feat considering the banal dialogue and trite plots with which he was saddled. Occasionally, he could even be impressive on the screen. Lanza’s seven films, together with The Student Prince—to which he lent only his singing voice--have been released on DVD by Warner Bros, which now holds the rights to all his movies. Of these, only That Midnight Kiss and The Toast of New Orleans have been remastered for DVD; the remaining five are "on-demand" releases from Warner's "Archive" series, and have (reportedly) been drawn from the best-available 35mm print. As such, they're an improvement visually on VHS and bootleg DVD releases, and generally feature superior sound. Seven Hills of Rome and For the First Time are also presented in their original widescreen format. Lanza's films can be purchased from online sellers such as amazon.com and moviesunlimitedcom. Note: As of January 2019, there have been no Blu-ray releases of any of Lanza's films. What's Your Favorite Lanza Movie? Principal Cast: Kathryn Grayson, José Iturbi, Ethel Barrymore, Mario Lanza, J. Carrol Naish, Jules Munshin, Thomas Gomez, Marjorie Reynolds. Lanza makes a confident screen debut with this movie. 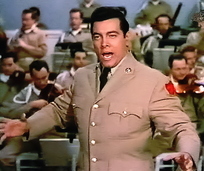 The scene in which he first appears—some fifteen minutes into the film—is teasingly executed: we hear his voice (singing the Neapolitan classic "Mamma Mia, Che Vo' Sape?") as co-star Kathryn Grayson enters her home, and with her (and the audience’s) interest thus aroused, the camera slowly pans to reveal his handsome presence. It's a great moment, helped by the fact that Lanza really does look terrific, especially in comparison with the portly stock tenor (Thomas Gomez) we have been watching only minutes earlier. Although Lanza has some formidable theatrical talents to compete with, including Ethel Barrymore, J. Carrol Naish, Jules Munshin and Thomas Gomez (hilarious as the aforementioned portly tenor). Keenan Wynn is also on hand as Lanza's amusing buddy, and conductor/pianist José Iturbi plays himself. The film is fun, and competently produced in the grand tradition of MGM musicals. Lanza doesn't have a great deal to sing, but among the highlights are a lyrical "Celeste Aida" (minus the recitative), the second half of "Una Furtiva Lagrima," and Jerome Kern's "They Didn't Believe Me," which is sung as a duet with Kathryn Grayson. All in all, That Midnight Kiss is an enjoyable romp with Lanza as its raison d'etre. The critics were not especially kind to the film—or to Lanza's co-star, the established Miss Grayson—but all were in agreement that it was Lanza who made the picture worth seeing. "Aside from José Iturbi's music, virtually the only excuse for this one is Mario Lanza, a singer whose talents would be conspicuous even outside a film devoted to opera. He can act as well as sing. But his efforts in both directions are hampered by an inconsequential story which enmeshes him with Kathryn Grayson—a girl who neither sings nor acts in his league." 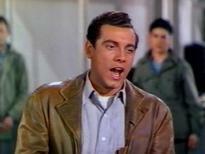 Principal Cast: Kathryn Grayson, Mario Lanza, David Niven, J. Carrol Naish, Clinton Sundberg, Rita Moreno. This is without a doubt the most consistently cheerful of all Lanza's seven movies, and a real hoot. The tenor's hitherto-unknown comedic skills are a big surprise, and the film boasts a wonderful supporting cast that includes J. Carrol Naish and David Niven. Kathryn Grayson is also back on hand as the romantic interest. This is the film that introduced the tenor's signature song, "Be My Love." The scene in which the song is first sung (as a duet between Grayson and Lanza) is great fun to watch, with both singers trying to outdo the other while impresario David Niven watches the pair with startled interest. The climactic Madama Butterfly Love Duet scene is even better, as Lanza throws caution to the wind and shows Miss Grayson the true meaning of passion. 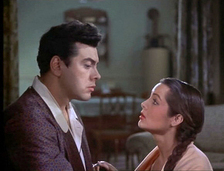 As Armando Cesari reveals in his biography of Lanza, there is more going on in this scene than meets the eye given that the real-life Grayson was not amused by her co-star's ardour! In the role of Pepe Duvall, shrimp fisherman from the Bayou, Lanza plays a character not entirely dissimilar from his own personality, with his lusty ways and thorough lack of pretentiousness. He sings well throughout, with highlights including "Libiamo, Libiamo, nei Lieti Calici" from La Traviata and a sweetly rendered "Bayou Lullaby." The comic scenes involving Lanza and Carroll Naish are a particular delight. Watching this film today, one is struck by how good the former's comic timing is—especially for a man who had only acted in one picture before this. "There is no need to continue with the story, not when there is so much enjoyment to be had listening to Mr. Lanza's extraordinarily gifted tenor voice and Miss Grayson's accomplished soprano . . . Miss Grayson and Mr. Lanza give us just enough in a duet from Madama Butterfly to further the wish that more of the opera had been used." Screenplay by William Ludwig and Sonya Levien. Principal Cast: Mario Lanza, Ann Blyth, Dorothy Kirsten, Eduard Franz, Ludwig Donath, Carl Benton Reid. This movie can truly be called life-changing. It certainly changed my life; I was quite ignorant of opera before a chance viewing of the film on television introduced me to this greatest of all musical genres. As it turned out, I was in illustrious company, for the number of singers inspired by this movie includes many of the biggest operatic stars of the last thirty years: Carreras, Domingo, Pavarotti, Nucci, Alagna, and Joseph Calleja (who discusses his favorite scene from the film here), to name but a few. It's easy to pinpoint the reason for The Great Caruso's lasting impact: Lanza. His vibrant personality overflows in practically every scene, and he's in superb vocal shape here. In other words, he is the film. This, after all, is a movie that is neither distinguished directorially nor in terms of its screenplay. Its scenario, in fact, bears little resemblance to the real Caruso's life, and the film is unashamedly corny in the grand tradition of Hollywood musicals. And yet none of this gets in the way of what Caruso's own son, Enrico Jr, called "vocally and musically . . . a thrilling motion picture." The success of the film, Enrico Jr, went on to declare, was due entirely to Lanza. Solo highlights include a fine "La Danza," a superb "Vesti la Giubba," exciting snippets of "Cielo e Mar" and the second half of "Che Gelida Manina," the Bach-Gounod "Ave Maria" (see clip below) and a rapturous "Because." 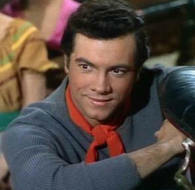 The distinguished Austrian character actor Ludwig Donath provides excellent acting support as Mario's manager, while Dorothy Kirsten and Ann Blyth are the nominal leading ladies. In her only film appearance, Miss Kirsten is wooden as an actress, but sings impressively. Ann Blyth is an endearing Dorothy Caruso. As an actor, Lanza does what he can with the vignette-like nature of the script, capturing--as Newsweek would later opine--the "personal mannerisms of the immortal Caruso." While some commentators have complained that Mario's Italian accent in the film seems to come and go; in fact, his sporadic adoption of a "foreign" accent makes sense, since he only employs it when he is speaking in English. At other times, when his character is supposedly speaking in Italian to his fellow countrymen, he drops the accent. Logical! The Great Caruso loses none of its magic on repeat viewings. As Enrico Caruso, Jr wrote over 25 years ago, "I can think of no other tenor, before or since Mario Lanza, who could have risen with comparable success to the challenge of playing Caruso in a screen biography." See also: The Great Caruso Effect and this memorable blog post by renowned music critic Greg Sandow. Principal Cast: Mario Lanza, Doretta Morrow, James Whitmore, Paula Corday, Jeff Donnell, Spring Byington, Celia Lovsky, and Eduard Franz. 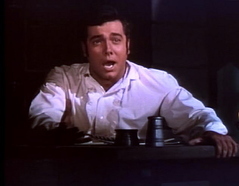 Because You're Mine was much criticized on its release as artistically a step backwards for the celebrated tenor after the success of The Great Caruso the previous year. With its rather trite and predictable plot, undoubtedly it was, but vocally, at least, Because You're Mine is more impressive than either That Midnight Kiss or The Toast of New Orleans. Highlights include a definitive "Granada" (in a key one and a half tones higher than usual) and a moving "Lord's Prayer," together with several pleasing operatic and popular selections. The film also boasts a fine co-star in James Whitmore, who provides much of the movie's comic relief, and a pleasant leading lady in soprano Doretta Morrow (of the Broadway Kismet fame). Lanza was initially opposed to making this movie, and gained an enormous amount of weight in the vain hope that this would discourage the producers from going ahead with it. Once actual filming began, he started to lose weight, dropping from 240 pounds to 159 pounds on the final day of shooting. As a result, his weight often varies substantially from scene to scene—a distracting but intriguing sight. Please also note: An official DVD version of The Student Prince was released in July 2011. Contrary to Warner Home Video's claims, the film has not been remastered, but the picture quality is a considerable improvement on the VHS, while the sound quality ranges from very good to excellent. An added attraction is that the DVD (unlike the VHS) is in widescreen format. Principal Cast: Ann Blyth, Edmund Purdom (lip-synching to the voice of Mario Lanza), John Ericson, Louis Calhern, Edmund Gwenn, S.Z. Sakall, John Williams, Richard Anderson. Lanza sings: A Mighty Fortress (part); Summertime in Heidelberg (with Ann Blyth); Drink! Drink! Drink! ; Serenade (Romberg); Ergo Bibamus; Deep in My Heart, Dear (with Ann Blyth) [see film clip below]; Beloved; I’ll Walk With God; Golden Days. Principal Cast: Mario Lanza, Sarita Montiel, Joan Fontaine, Vincent Price, Harry Bellaver, Joseph Calleia. Although Seven Hills of Rome (Italian title: Arrivederci Roma) made a reasonable splash at the box office—particularly in Italy, where it was a huge success—it is undoubtedly Lanza's weakest movie effort, and a film that the tenor later described as "terrible." Lanza was particularly hard on his own performance, but watching the movie 56 years later it is apparent that the fault isn't his, but rather the meandering script and lack-luster direction. To make matters worse, there is very little in the way of substance for Lanza to sing. The tenor is reduced to performing just one aria ("Questa o Quella") and a fragment of another. 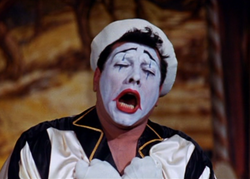 In fact, the vocal highlight of this movie is arguably Lanza's imitations of other singers. His impersonations of Perry Como, Frankie Laine, Dean Martin, and Louis Armstrong are very entertaining. The original script was reportedly a good one, but the producers soon realized that it contained enough material for a five-hour movie. This resulted in drastic re-writes (even on the film set), and therein lies the problem. This is a movie without a solid story, and instead we are left with some enchanting shots of Rome, some sporadically good acting from Lanza, and two engaging co-stars in Marisa Allasio and the popular comedian Renato Rascel. *Note: Seven Hills of Rome was released (as Arriverderci Roma) in an Italian-language version (with Lanza's dialogue dubbed by an Italian actor) on 21 November 1957, two months before the premiere of its English-language release on 30 January 1958. 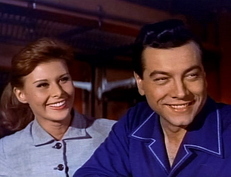 Principal Cast: Mario Lanza, Johanna von Koczian, Kurt Kasznar, ZsaZsa Gabor, Hans Sohnker. Please note: The sound quality on the official DVD of this film (see clip below) is disappointingly thin at times, with the musical selections far more richly reproduced on the VHS version of the movie. The picture quality of the DVD, on the other hand, is superior to the video release.